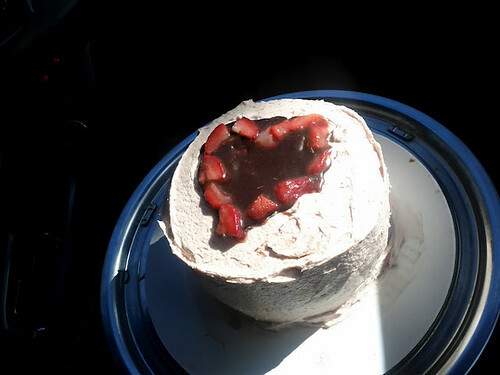 I have dubbed it the Strawberry Heart Cake. Literally, it’s a vanilla victoria sponge cake with strawberry buttercream frosting, dark chocolate strawberry filling, and some kirschwasser sprinkled on for a bit of fun. I used some of the chocolate filling to make the heart shape on top. And when that didn’t quite work out, looking a little too blobby to my critical eye, I traced the outline of the heart using frozen strawberries. I probably should’ve spread the chocolate sauce out closer to the rim of the cake. I make this same mistake so often, you’d think I’d learn by now. 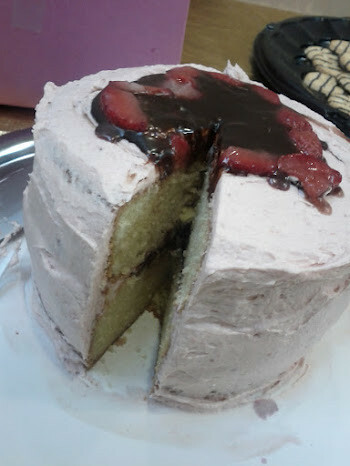 But I was worried about the dark chocolate sauce squishing out between the cake layers and messing up the light pink buttercream, so I was conservative. Anywhoodle, it seems to have worked out okay. And by okay, I mean deliciously. To put everything together, I placed one cake on a cake round, bottom down. The bottom cake was basted with kirsch, then I spread the chocolate sauce on top of it. I used some of the frosting to make a ring around the rim of the cake to help ease my paranoia about the chocolate sauce making a break for the wall, then placed the top cake, bottom up. Then it was time to frost the whole shebang. And then it was time to eat! 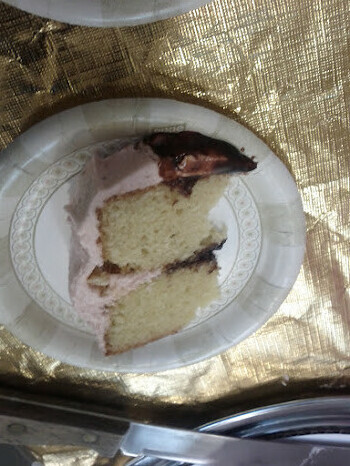 This is a six-inch cake so I actually used a cupcake recipe rather than scaling down a recipe for a larger cake. I only have one six-inch cake pan so I divided the ingredients in half and mixed one batch at a time to make a two-layer cake. Here are the ingredients for one layer. Cream together the butter and sugar. [If you’re like me, you’ll use the butter wrapper to prep the baking pan, and then spritz it with Baker’s Joy anyway.] Add eggs to the butter/sugar mixture, one at a time, beating between additions. Add vanilla. Sift together the flour, baking powder, and salt. Fold dry ingredients into the butter/sugar/eggs mixture. Scrape the batter into a six-inch pan. Bake at 350 for 20-30 minutes. I let the cakes cool in the pan for about 20 minutes before placing them directly on the cooling rack. They cooled out on the counter for maybe another 20 or 30 minutes, then went into the fridge while I prepped the frosting and filling. The frosting was inspired by the raspberry buttercream frosting recipe in Vegan Cupcakes Take Over The World. The proportions here provided just enough frosting for the outside of the cake. Cream the butter and confectioner’s sugar together until the mixture is smooth. Add the strawberry preserves a spoonful at a time until the frosting has a spreadable consistency [and a pleasing flavor!]. I just happened to have some thick fudgy dark chocolate sauce lying around, leftover from a chocolate pancake experiment, so I mixed that with some more of the strawberry preserves and used it as a filling. Because it just isn’t Valentine’s Day without chocolate. 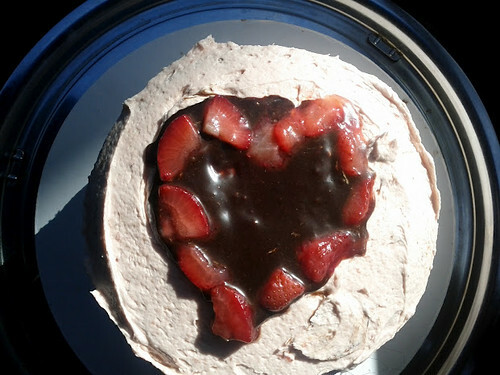 This entry was posted in baking, berries, cake, dessert and tagged berries, Cake, Chocolate syrup, Icing (food), Valentine Day. Bookmark the permalink.